I'm back to painting zombies! Well, sort of - I managed to finish a pack of Zombie Wolves from Gamezone Miniatures. I wanted to have those beautiful miniatures probably ever since I started collecting undead - and got them cheaply some years later on eBay, that was quite a steal! Then I filled the gaps between the parts and then they lingered on a shelf while I was doing other big projects. I finally took them while I was working on Vaclav, because I wanted to post something new, instead of just spamming zombie groups and I hoped that I could squeeze a small project somewhere in between... and well, seeing as I am posting them now, that didn't work out that well! Still, I found some color schemes and basecoated them at that time, so I had at least that going for me! Painting them went really quick and I had lots of fun with it, unlike the last Gamezone model that I painted... that gives me great hopes about their Mournful Knights, which are also waiting for their turn for a long time. Seeing as there is only one unit of them and they are much less generic than the current GW ones, I wanted to make them a little bit special - so I painted their fur differently, getting some inspiration from pictures of real wolves and dogs. It mostly got lost underneath the rotting flesh and blood, but I think it gives them an interesting feel and I think they turned out good enough. Sorin, fond of using wolves in his plans, usually resorts to local ones buried under the Varsavian earth. Only on special occasions he uses his own, trained pack of undead canines brought from the far north. Bigger, stronger and more resilient than your usual raised wolf, they are very reliable scouts, pursuers and distractors. Sorin’s kennels are big enough that with some necromancy added, he will never run out of beasts to help him catch especially elusive prey. As promised, here I am going with more wights - or in this case, liches, disciples of Daremnych. This one here is a gorgeous model from Otherworld Miniatures, bought a long time ago, finally painted. He was something different in this typical scheme of mine - there was just way more clothes than metal, so I couldn't just drown it in verdigris! Still, I think it worked in my favor in the end - I got lots of space to paint freehands on, the red robe reinforces his image as an evil wizard and patina got used only as subtle, yet effective accents. Immediately after being raised, Daremnych started to look for his old lieutenants - to replace living necromancers as soon as possible. The first one found was Mertvet - the most reliable one. That wasn’t thanks to his loyalty or stability, no - rather, the opposite. He could be simply expected to always act in his own interest. Where a loyal man could be broken in the most unexpected moment, Mertvet’s betrayals could always be planned for. He got recruited into Daremnych’s cult when he was busy terrorizing the countryside as a powerful, immoral wizard conducting experiments on people he captured. In exchange for his help in the Death God’s army, he could continue his deeds while enjoying the newfound security, without being harassed by heroes trying to slay him. That and he didn't have to risk the price of denial - fighting much more powerful Daremnych - which was in the end, the reason for his death a long time ago. After being raised, Mertvet and the Great Priest decided to simply continue their agreement as if nothing happened. She is indeed great a model, a pleasure to see. And those images on the clothes are truly amazing! @Menkeroth The model indeed was a pleasure to work with, thanks! Long have I wanted to have a unit of Cairn Wraiths - the least used an least popular 'Rare Unit' from the 8th edition Vampire Counts armybook. It was just way too expensive for what they did - but I still wanted to get them, for the sake of completionism at least. Using the same character Cairn Wraith 10 times wasn't an option, I didn't want to hunt for all the oldhammer instances of them and I couldn't find a good base for converting/building them too, so the idea was waiting in the backlog for years. Then GW released Grimghast Reapers and I knew those are the ones I was looking for! Still, some conversions were in order - thankfully I already had an idea in mind. I didn't want to have a full 10-ghost unit of grim reapers, because I find that a bit silly, so I decided to replace the blades with axes. Cowls and blinded faces were also a little weird, so I replaced them with normal skulls and Slavic pointy helmets, adding some cloth around it too. That made them more similar to real warriors rather than angry farmers - while still keeping the fantastical theme pretty strong, so all was good. Then I had to mount them on bases. That was a problem because they were designed to stand on loose 32mm rounds, rather than on tightly packed 20mm squares that WFB cairn wraiths used. To make it work I converted them completely first and only then began mounting them on bases, moving, switching and adjusting them together. I found a good configuration but that not only required cutting some ghostly strands and bending others but also left many of them standing very off-center on the bases. To remedy that, I had to immediately magnetize them and build a tray for them - without it, only 2 of them are able to stand upright! I like them like that, though - they stand so close to each other, they blend into one ghastly mass, like a Wild Hunt of some sort. Only after seeing them like this I decided to add those branches on the ground - both to reinforce my forest theme and to hide their connection points a bit. Now I really look forward to painting them! Last week in work was pretty hectic, so I was relying on automatic posts on my blog and didn't come around to post here Now I will catch up and post two to bring it all up to date. First, continuing with the ancients, here we go with the second liche. This one is a model from Frostgrave - I found it when I was looking through their range, looking for something fitting to incorporate in the Zombie Legion. With his pointy hat/helmet and ragged robes, he was perfect as another liche - I didn't have to think long about buying him! The painting scheme is the typical one for wights/liches - and while Mertvet was interesting because of how much fabrics he had on him, this one has just the right amount of clothes, bones and metal parts and I think he turned out pretty well. The second one of Daremnych's lieutenants was Belomor - an eager Varsavian priest that tried to convert some chaos tribes to his indigenous beliefs. He was found and saved by the Great Priest just when he was about to be sacrificed by the barbarians. After that, he quickly took faith in the Death God, the one that spared him after his old gods ignored his pleas. Soon enough he proved to be one of the most fervent members of the cult - spreading the faith however he could, by force if necessary. He was also known for always maintaining a kind, fatherly attitude, even while burning the villagers one by one to make an example for the rest. Killed during one of such spectacles and only now raised, he wants to show the unbelievers that he went too soft on them the last time. And now I can show Daremnych with both of his lieutenants/disciples together. Now my wights have some magical support! 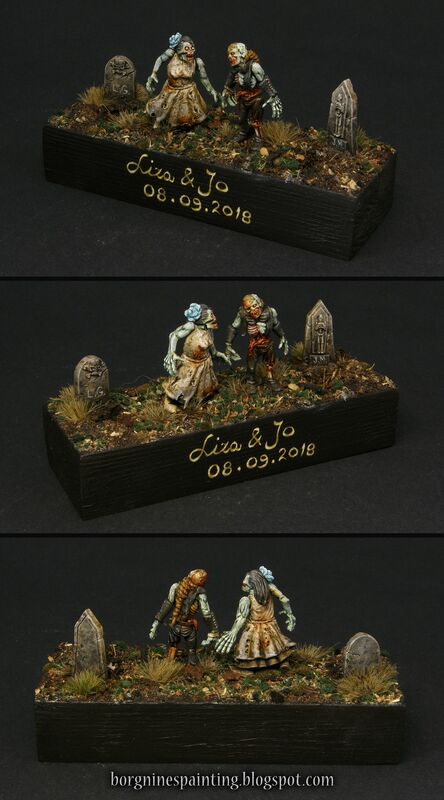 And the second post, wedding zombies! A present for no one other than our @Theerteen ! I visited Cologne this year - and before going there I asked @Theerteen if he wanted to meet. He told me that we couldn't hang out normally in the city, because he would be busy having his own wedding at the moment, but he would be happy if I would come to the party. So, by pure chance, I got invited to my first German wedding - one that was horror themed too! It was only logical for me to make some undead-related, wargaming present for him and his wife. I choose zombies because I became kinda known for them here, that would make it more personal and because they were simple enough to do them on that rather tight schedule. Thankfully I managed to finish it on time and we arrived on the party - where not only the married couple and other youngsters were dressed as zombies/vampires/cultists/witches, but also most of the uncles and aunts! A cake had a graveyard decoration on top with a bloody red inside, the snacks were little cookie 'fingers', drinks were red, the decorations were cobwebs and in the front of it, all was organized a tent with a grisly escape game! 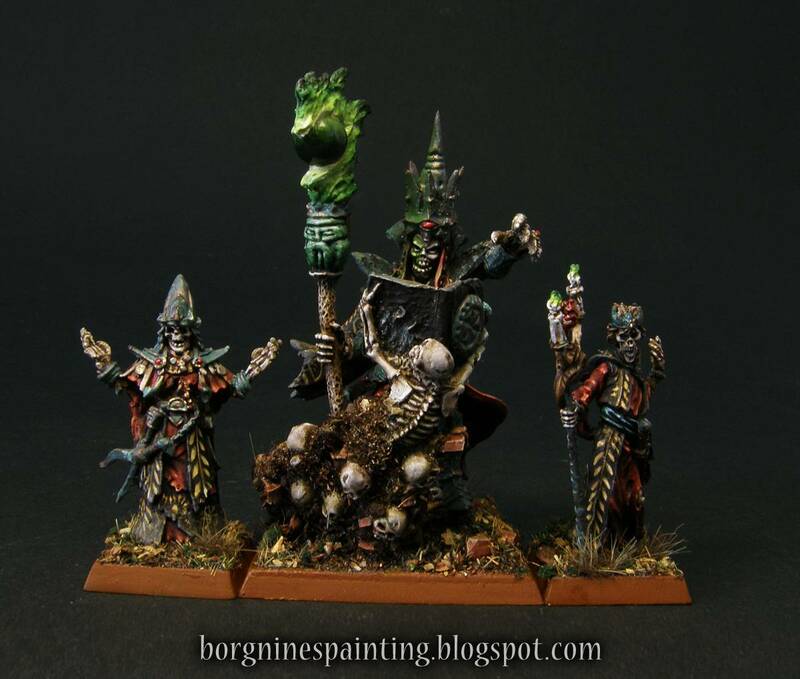 Now that's some dedication, no wonder that the guy collects also undead miniatures! The present was a perfect fit into all that, they looked almost exactly like that. Looks like you've been busy all summer and fall and I've done almost nothing. Your dogs look great! Are those the Gamezone ones? I really like them and thin they fit the look of your army well. They are metal, no? I love the look of your new characters. As you may know, I also want to convert over all my necros to liches (have them undead). So lead on the charge my friend, they're looking great as well! As for the Reapers, well, you beat me to it! I like what you've done with the axes and the hats, they will tie it in for you. I can't wait to see them painted! Borgnine, what a wonderful gift! It's amazing! It's also awesome to see people of our community getting together in the real world. I wish we could get together for some gaming some time, but it's a big world! Congratualtions @Theerteen what a cool wedding idea! I think there's little more to add to what has been said. @Eternal Salvation Well, having a blog on which I force myself so have a post every week can keep someone kinda motivated! Thanks! Yes, the wolves are from gamezone and they are metal - and they were easier to put together than any other minis from them I have! And I'm finally back to the basilisk. Like I said in the WIP post already, here I am going with monsters that are in no way usable in my army, but they fit the theme. Perhaps I will find some use for them later! Here I am starting with a basilisk - a GW cockatrice converted a bit to resemble a rooster a bit more. When it came to painting, I also decided to reference roosters - the idea was to make it really just a giant snake-chicken with crazy eyes. That's how I chose the colors for the feathers, beak, face and the mane. The snake parts were then painted to resemble a viper commonly found in Poland, with a characteristic zigzaging pattern. When it came to wings and skin I had to think of something - so I referenced the colors I already used and made an organic pattern to make it a tad more interesting. It was nice to paint a well-sized monster like this, not too small and not too big - but damn I don't like painting wings! If asked about a basilisk, most Varsavians will tell you that it’s a snake-rooster about the size of a housecat, whose famous petrifying gaze will cause only slight numbness at worst. It’s a rather common pest. Only an unfortunate minority will tell you about a giant monster capable of easily tearing an armored man to pieces and easily petrifying anyone for long enough to be hauled back to the nest to be devoured. That is the Great Basilisk, a scourge that has been terrorizing Varsavia for many, many years. Wise men tried to deduce how it came to life - some say a beast like that is born once every 100 years from an egg laid by a rooster, while others say it’s just a chaotic mutation of a normal basilisk. No matter what’s its origin, this basilisk just appears from time to time to wreak havoc around the countryside, attracting foolish heroes to die while trying to kill it. Even those trying to turn its own gaze against it with mirrors discovered that the beast is simply immune to its own powers and can still use its beak and claws to tear and rend. Until someone manages to kill it once and for all, both villagers and armies marching through Varsavia have to factor in the possibility of a great basilisk attack. Beasts of chaos are often very impressive. Amazing work on a fantastic model. Your painting never fails to impress and inspire! Keep up the Polish Painting Prowess! 10/10 would run away from a chicken. Nice beast, the head is definitely my favorite part, but I also like the snake scales. On top as always! @The Gunslinger thank you too, glad you like it! @Eternal Salvation There's no lack of this resource in the world, but I try to do my part! Thanks! @Theerteen 10/10 comment, would read again! Thanks! And here I begin with my foray into Warhammer Underworlds! One day I got an idea about converting some Stormcasts. Not wanting a full army, I decided to get a box of Shadespire. This gave me 5 khorne guys, the second warband from that set, so I had to think what to do with them too! Finding them too golden and ornate, I decided to turn them into much simpler, gritty, Viking-inspired barbarians. The first thing to do was to get rid of their weapons and replace them with low-fantasy ones - either finding something from my bits box or sculpting them from scratch. Next one was the worrying lack of facial hair amongst them. I understand that GW maybe wanted the leader to stand out a little more with his glorious beard, but that was not enough for me. I replaced two other heads with Chaos Marauder ones, they worked like a charm here. The remaining two got some hair sculpted. Finally, I simplified their armor and got rid of any Khorne iconography, replacing it with a single rune in some places. Fluff-wise I want them to worship Khorne in their own way, unaware of the 'mainstream' cult. They will know the Blood God under a different name, use different symbols, but still believe in the importance of spilling blood and piling skulls for the skull throne. I must admit, this colored plastic is handy when showing conversions, it's really clear what's the original substance, what's kitbashed and what's sculpted. This time, a little more on-time. A weird, kinda nostalgic update today - not really something new, but rather more of something old! Grave Guard from GW were the reason why I started collecting Vampire Counts a long time ago. I got my first, 20-wight strong unit of them pretty quickly and it was thanks to them I got the idea of making my army Slavic-oriented and started using the popular patina/verdigris color scheme. Only later I noticed that 20 Grave Guard wasn't that much - and pretty often I had to proxy them. After that, I started buying more boxes of them, planning to expand my unit sometime. And now, 5 years later, I have finally painted all of them - and my big bad death star of 50 wights is complete! During those years I expanded the Slavic theme in my army, so when I was building these guys, I made a lot of pointy helmets for them. Some of them turned out rather crazy high - but I still have yet to decide if such exaggeration is good, or if I should tone it down next time. Like the old unit, they also have different blades on their weapons (swords from the Skeletons box), because I never liked the original ones. The painting side of the whole project was, of course, the same as 5 years ago, only this time it was probably much quicker and tidier. Wight warriors are the most effective undead troops in Varsavia - but that amounted to nothing in the face of innumerable hordes of zombies and ghouls available to the vampires and necromancers, the wights’ rivals in the land. Zlyshko wanted to bolster his forces ever since he was raised, but finding the right tombs was difficult, especially if he had to stay beneath his ‘allies’ suspicion. Only when Daremnych joined him, they could strengthen their forces with new warriors - all of them skilled, clad in heavy armor and wielding the cursed blades of the ancient Varsavia. With this new host, they could start openly fighting for their rightful place in this realm. They are just perfect, especially with that rust of theirs. But so many! Can imagine what it took to have painted them. Right!? Especially with all the freehand detail. They look awesome! @Borgnine You'll have to excuse my lack of time right now as I'm just browsing updates quickly and will have a proper flick through your plog when I'm not so pressed for time. I've got dribs and drabs of a wraith unit in the works and was planning to buy more Cairn Wraiths for conversions (and may still yet), but seeing the new AoS wraiths on squares ranked up is tempting me to get a box. Nice work using them and sweet conversions! Excellent work mate, will catch up more on your recent work soon! Keep at 'em!